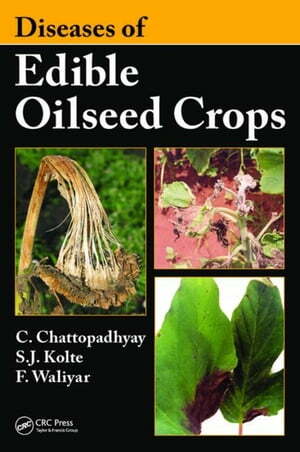 Collins Booksellers - Diseases of Edible Oilseed Crops by Chattopadhyay, Chirantan, 9781466595668. Buy this book online. Diseases of Edible Oilseed Crops presents an unprecedentedly thorough collection of information on the diseases of cultivated annual oilseed crops, including peanut, rapeseed-mustard, sesame, soybean, sunflower, and safflower. Written by internationally recognized researchers, this book covers and integrates worldwide literature in the field up to 2014, setting it apart from other books that are only of regional importance. The book focuses on major diseases of economic importance to each crop. Each chapter is devoted to a type of crop and a profile of affecting diseases according to geographical occurrence, epidemiology, symptoms, causal pathogens, host-pathogen interactions, biotechnological aspects, and the latest approaches to understanding host-pathogen interactions. It also includes discussions on developments on controversial subjects in research in order to stimulate thinking and further conversation with an eye toward improvements and resolutions. Research on oilseed crop diseases has expanded tremendously in the past 30 years, primarily as an effort to reduce losses to various stresses, including crop diseases. In the war against hunger and malnutrition, it is necessary to enhance and update knowledge about crop diseases and managing them. By compiling decades of information from previously scattered research into a single globally minded volume, Diseases of Edible Oilseed Crops provides these much-needed updates and enhancements.